Saint Mary's Hospital - Scott Springfield Mfg. Retrofitting 100-year-old Saint Mary’s Hospital with a state-of-the-art custom air handler required innovative engineering solutions, the kind Scott Springfield Mfg. Inc. is recognized for in the HVAC industry. 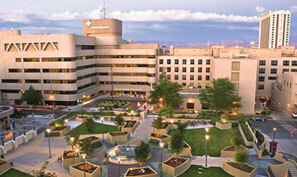 Hospitals are often candidates for HVAC retrofits and upgrades. Their buildings can be in service well over 100 years, but today’s medical techniques require state-of-the-art air handling solutions. Managing the patient’s physical environment directly impacts the quality of care. Saint Mary’s Hospital exemplified the challenges that occur when air handler updates and retrofits are undertaken. The facility presented significant structural limitations requiring Scott Springfield’s custom solutions in both design and installation. Scott Springfield Mfg. Inc. was chosen to manufacture a custom air handling unit to serve the Saint Mary’s surgery suite. The retrofit solution required a surgical AHU with state-of-the-art accuracy and reliability. The facility was very old and presented significant structural challenges. Limited access into the mechanical space and the requirement for redundancy placed exceptional challenges on the air handler design. The existing mechanical room access door measured just 48 inches wide. The only viable solution: a twelve piece unit built to fit through the available access. The stacked design is comprised of four sections on the top level and eight sections on the lower level. Every section fit through the 72 x 48 inch door without sacrificing quality or performance. The largest sections were 46 inches wide and the smallest only 27 inches wide. The installing contractor, Applied Mechanical Inc., was surprised with how quickly and easily the unique structural angle framed split design was assembled in the mechanical room. Custom air handlers for surgery require a highly redundant design. Multiple fans compensate for any breakdown and allow the system to be certain of proper air volume delivery. Multiple fans also reduce the footprint of the unit and are a great solution for smaller mechanical rooms. The Saint Mary’s Hospital surgical air handler was designed with a fan array of four supply fans and two return fans to ensure redundancy and reliability. Each fan is wired to a variable frequency drive and controlled by a unit-mounted Reliable™ programmable logic controller (PLC). In order to allow for seamless operation in the event of a PLC failure, a backup PLC was mounted in the air handler. Surgical suites impose demanding requirements on air handlers. The unit must be exceptionally reliable. The air delivered to the surgery suite must be controlled to provide precise air volume, temperature, humidity and cleanliness. The unit must be serviceable and reliable for decades to come. after the fan. For this application, all coil ratings and fan selections compensate for lower air density at the jobsite elevation (4,500 feet). Because the application serves a surgery suite, design criteria required a unit that would provide clean air along with a long operational life. WATER MANAGEMENT: To prevent corrosion of the inner materials and to allow easier cleaning, 304 stainless steel and a wash down liner were used throughout the coil, humidifier and mixing sections. Wash down liner and fully welded aluminum tread plate floor allow Saint Mary’s staff to wash out debris from the coils and humidifier then chase the water through the floor drain. Penetration of water into the insulation is prevented by the wash down liner and 1.5 inch water dam – standard on all SSM units. FAN CONTROLS: The six fans in this unit have independent Danfoss™ Micro-VFD drives to provide individual frequency control. The flow volume through each fan is measured and controlled by the PLC controller. The SSM fan control system allows facilities staff to verify flow volume through each individual fan and change the flow on demand. Redundancy is assured via individual speed control on each fan. This control method also ensures that the velocity profile within a tightly packed unit will remain uniform regardless of inlet condition, uneven filter loading, or discharge location effects. Additionally, the PLC controller allows SSM’s air handler to connect to the Saint Mary’s Hospital DDC system via BACnet™. Scott Springfield Mfg. Inc. manufactures equipment for custom and industrial air handler markets. We have the capability to effectively meet any of your air handler requirements. Saint Mary’s Hospital is one example of the creative range of construction methods and best-in-class engineering solutions we offer for challenging applications.